It is Madagascar’s secret emblem: The zebu (Bos taurus inidicus), in Malagasy language omby. 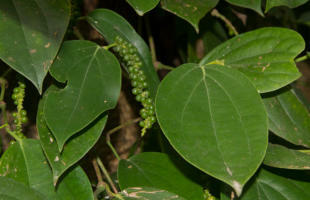 You can see them everywhere around the country, about 19 millions live on the red soil of the island. In Madagascar, zebus symbolize power, strength and particularly prosperity. An average zebu tips the scales at 300 to 400 kg – at an shoulder height of approximately 130 cm. Naturally, there are more than only external differences to European cattle: Zebus tolerate heat well and are relatively resistant to diseases such as the African rinderpest. But they fight other diseases, and few Malagasy can afford treatment. 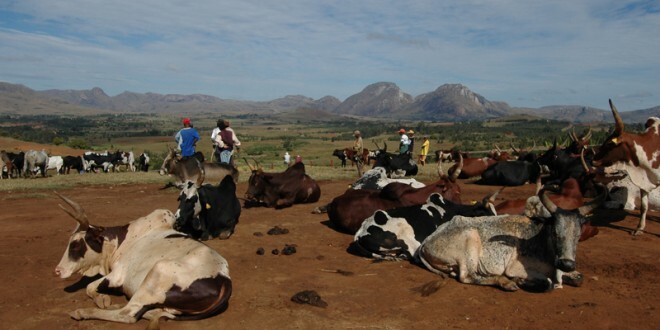 Parasitosis, fungal diseases of the skin and tuberculosis are wide spread zebu diseases in Madagascar. Where is no veterinarian, people get by with traditional healing plants and magic. Nonetheless, the half of all born calves dies before completing their first year of life. 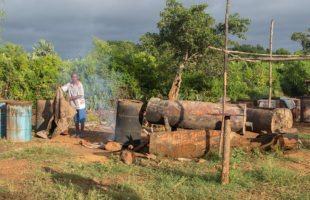 In Madagascar, people keep zebus in a very traditional way. In the highlands and along the east coast, young men or children bring the family’s zebus to meadows during daytime, make them walk them along the numerous Routes nationales or let them graze in the forest. The animals wear thin ropes around head and horns, sometimes leading through the nose, and usually let the ropes slide behind them on the street, especially in smaller herds of cattle. In the night, the men drive all cattle into the village and keep them in a cattle pen called fahitra until next morning. Cows usually stay inside the village or near the houses of their families, meanwhile bulls serve as status symbol in larger herds. The larger the herd you, the higher your reputation and prosperity of your family. This applies especially in tribes whose lives always has been closely linked to the zebus. 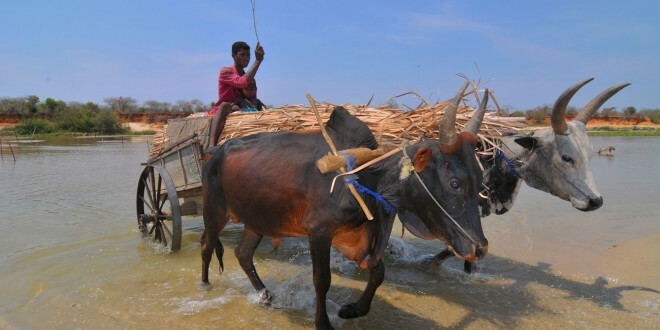 The Bara and Antandroy of southern Madagascar are traditional cattle breeders and keepers. They have always been living with and from their cattle. This is why you can gaze at the largest herds of cattle in the hot south of Madagascar, where they spend weeks and months with their sheperds on barren areas, today only covered by zebu grass. 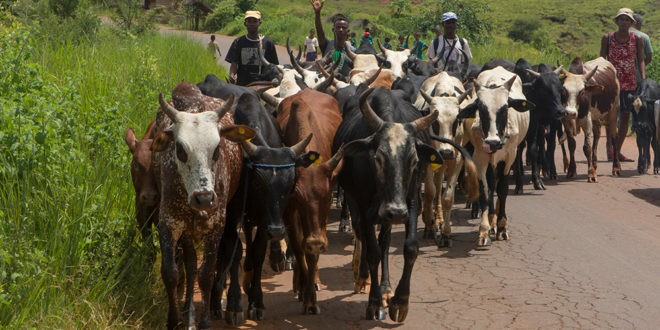 It is a famous tradition of the Bara that young men have to prove their courage by stealing a zebu before being allowed to ask for a girl’s hand. This tradition is widely used still today, and leads over and over again to violent conflicts. Several gangs of thieves have been stealing cattle with armed force for years, and are not shy of arrack travelers and Taxibrousses, too. Therefore the security situation of southern Madagascar has sadly been precarious for years. 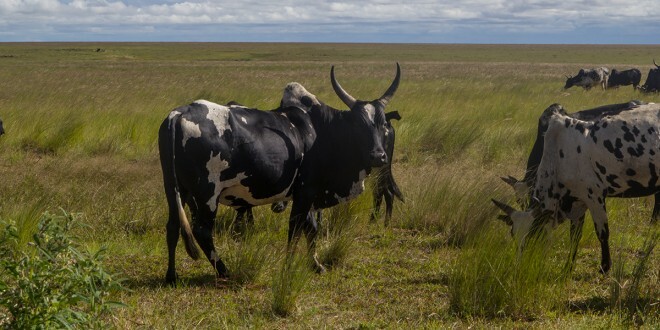 Stolen zebus, so-called omby maloto (dirty cattle), can be found in almost every larger herd. Thieves can excellently hide them among their officially kept zebus, omby madio (clean cattle). 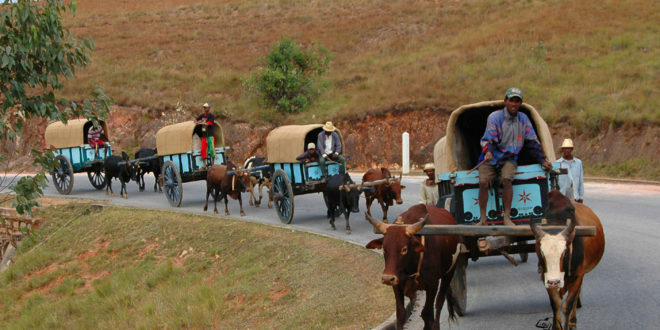 Despite giant herds of cattle and thus high reputation in society, many Malagasy of the South are extremely poor. 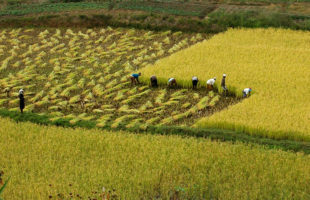 Droughts lasting for years without any rain lead to water and food scarcity. There is targeted breed on a small scale, but the value of a zebu is not necessarily linked to its health, milk or meat production. Traditionally, certain colours and long horns are more valuable. Every owner marks its zebus by distinct ear notches, which is called sofindrazana (ear of the ancestors). The third people of Madagascar, which is closely linked to zebus, is the Mahafaly tribe from southwestern Madagascar. 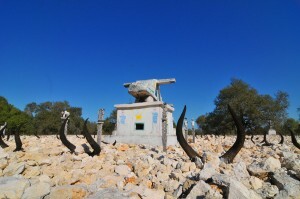 You will recognize their graves even from a distance, because they are painted, got Aloalo called wooden totems and countless zebu skulls on top. The more influential and important the decedent was, the more skulls are on his grave. In northern and western Madagascar, it is the Sakalava people who owns the most there living zebus. At the east coast, few people keep zebus, this is rather more a place where zebus from other areas of the countries are shipped to. 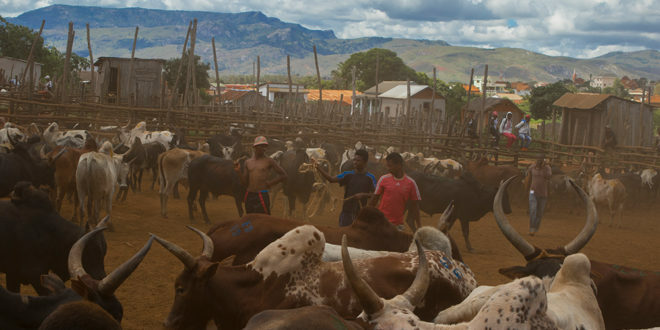 The largest cattle market of Madagascar is located in Ambalavao, in the foothills of the southern highlands. Each wednesday, shepherds and cattle breeder come together to present their zebus to potential customers. 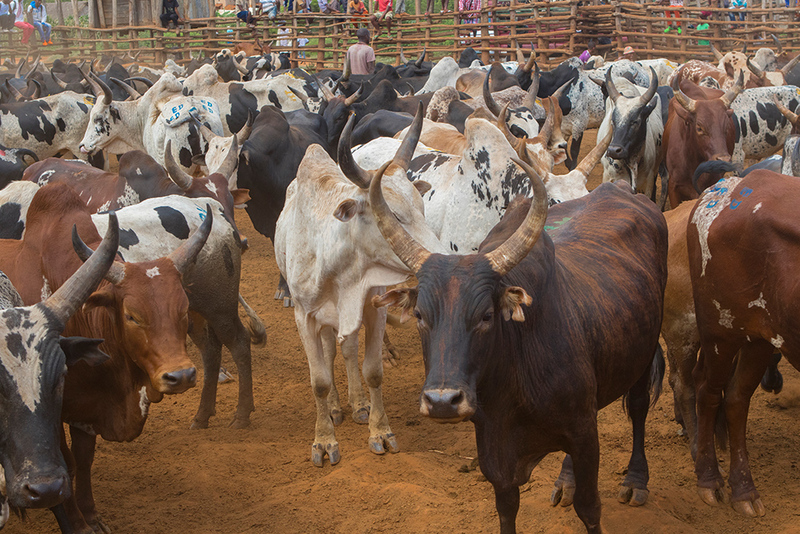 Partly they have covered hundreds of kilometeres or miles to arrive here with their cattle. 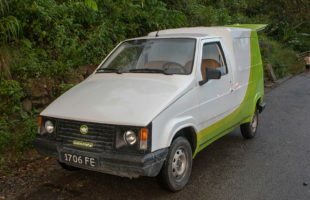 Big dealers, so called mpandranto, buy good zebus and load them onto trucks, where the animals stay closely tied together during the transport to the next slaughterhouse. 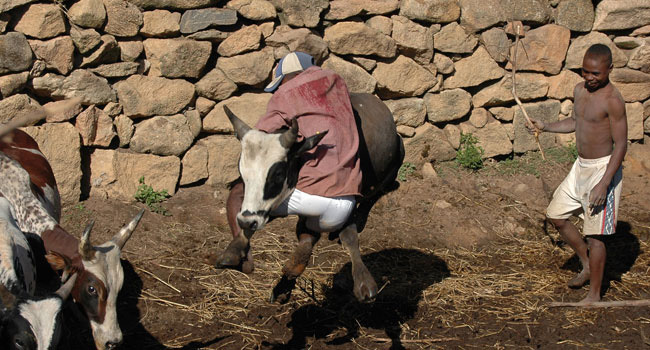 Zebu rodeos, where young men try to clinge themselves on the back of a zebu as long as possible, are an integral part of tradition. 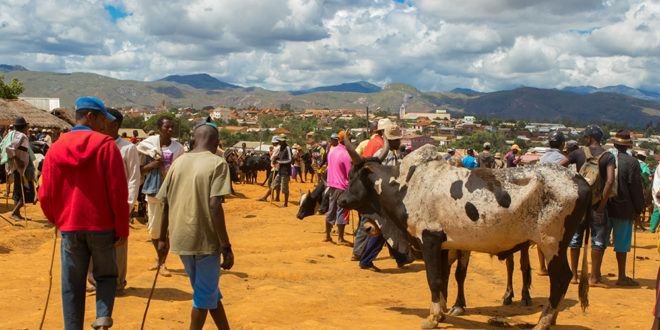 Ambovombe, a city at Madagascar’s south coast, has the second largest cattle market of the country. 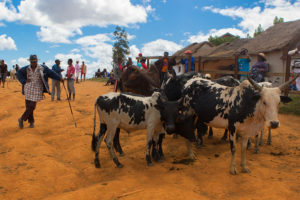 Up to date, only a handful of slaughterhouses exist in Madagascar (Mahajanga, Morondava, Fianarantsoa, Antananarivo), thus most zebus are slaughtered in private courtyards. Butcheries like you know them from Europe do not exist in Madagascar, and cold stores are very expensive. As a result, the meat cannot hang and age, which makes it rather chewy in your meal. 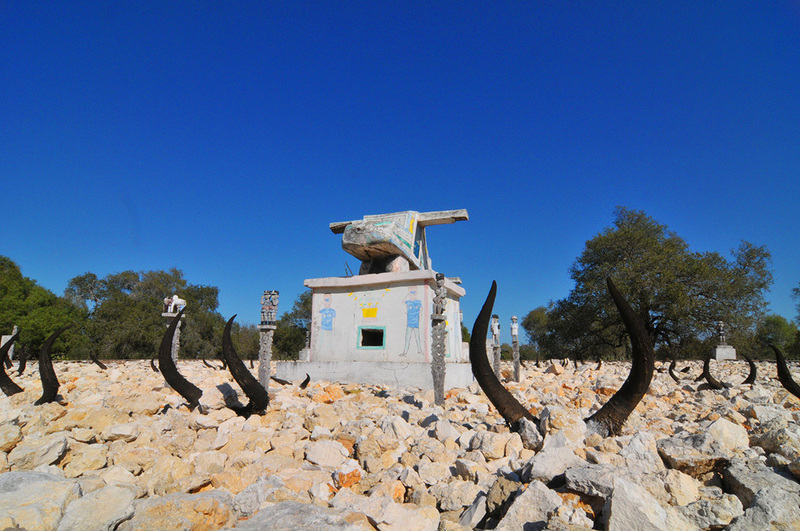 All parts of a zebu are sold in local butcheries: Usually, this is a shack with meat on top of some wooden planks, stored without any cooling. Indeed there has been a blue stamp for “daily freshness” since some years, and butcheries have to own an official certification. But particularly in small villages far away from any city, all of this remains theory. It may also be a matter of definition whether a piece of zebu tongue is “fresh” after ten hours in 30°C. Malagasy people eat meat as well as innards; skin and fur are processed into leather or sold as raw material. From the horns, artists create lovely jewelry, decoration objects or cutlery. Further more, zebus are Madagascar’s typical sacrificial animals. Ancestor worship has a very high priority for most Madagascans. If you sacrifice a valuable zebu to your ancestors, you will keep on the right side of them, and they will control the fate of the living to your benefit. Thus all festivities need a slaughtered zebu: Marriage, funeral, Famadihana, building a new house, new year’s Eve and many other occasions. Meat is then portioned according to strict rules. Many restaurants today offer beef on their menus, although it is seen as less valuable than pork. A zebu in Madagascar costs between 400.000 and 500.000 Ariary (120 to 160 €), which corresponds to more than monthly salary of most people. Besides, most zebus earn their living as draft animals of the ever-present Charettes, serve as dowry, are partially used in rice cultivation and embellish countless arms, stamps, banknotes and even the official seal of the country. In many places, people drink the cows’ milk, although it is often not much more than enough for the calf. A zebu cow gives one to two litres of milk per day. Compared to European high performance breeds with peak values of 80 litres a day, this is of course a quite small amount of milk. 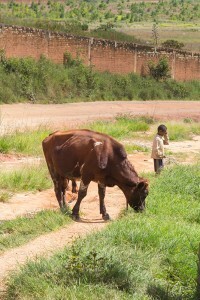 During the last years, there have been some attempts to raise dairy production in Madagascar. The extensive import of high performance dairy breeds like Holstein Friesian with professional keeping system was part of these attempts, done by the dairy factories Tiko, SMPL, CLT (Centrale laitiere de Tananarive) and LMG. With the 2009 coup and the following political crisis, all those factories disappeared from the market, and the up to date average consumption of milk per inhabitant is one and a half litre per year (for comparison: In Germany, each inhabitant drinks almost 60 l of milk per year). The remaining demand is covered by imported milk powder. The once imported milk cows were distributed over the highlands during the last years. They are called omby rana, because they lack the zebu humpback. Still today, you can see the result of several attempts to cross zebus with milk breeds around Antananarivo. The former dairy industry was exclusely restricted to Antananarivo and Antsirabe, and you can find a small chesse production in the latter still today. 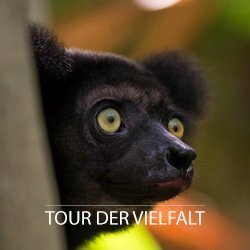 Since 2015, Tiko is being built up again. But Madagascar’s zebu is not only object of value, it sadly is also a big factor to Madagascar’s ongoing destruction of the environment. Large areas of rainforest are slashed and burned for cattle grazing, and after years, you cant use them for anything anymore. 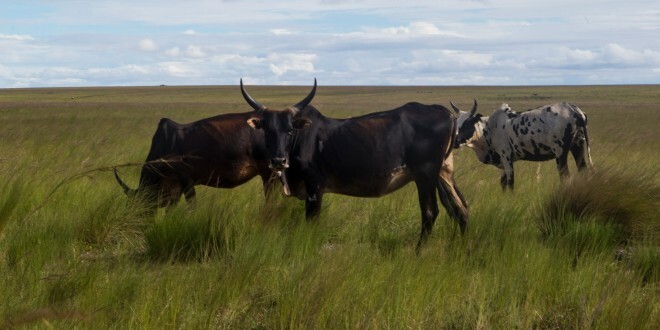 More than 60% of Madagascar’s land area is declared pasture. Especially the south of the country, formerly covered by dense spiny and dry forests, looks like a deserted field today. 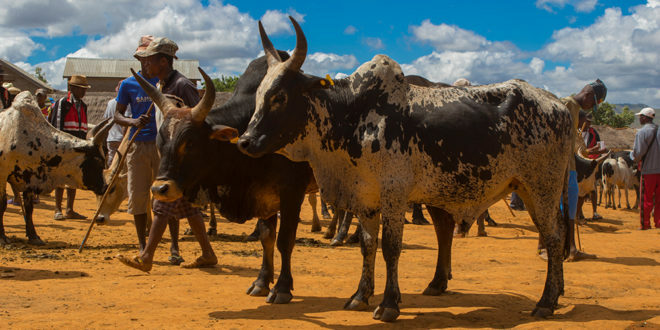 Only 5% of Madagascar’s zebu population is slaughtered per year, which makes a massive surplus of animals only kept as status symbol. 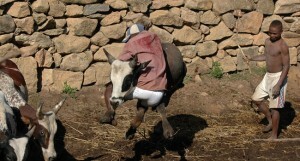 In western Madagascar, there exist even some run wild zebu herds owned by noone (omby mahery). 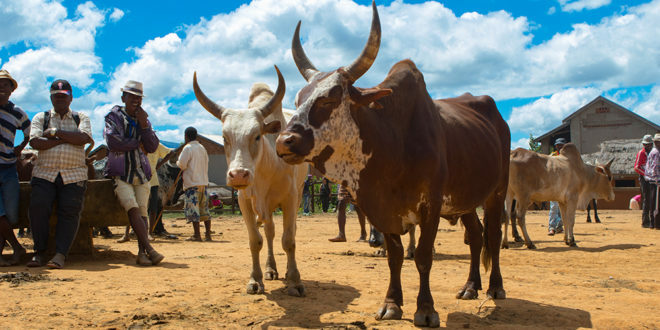 But all that in no way diminishes the zebu’s status in Madagascar, and it can be assumed that zebu cattle will play an important role on the fourth largest island of the World for many, many decades.